Here at NEHGS, we are always on the lookout for interesting genealogical books, pedigrees, or other formats for documenting family history. One of my first blog posts here covered the Society’s acquisition of a fascinating (and literal) family tree showing all of Queen Victoria’s descendants at the time of her Diamond Jubilee in 1897. 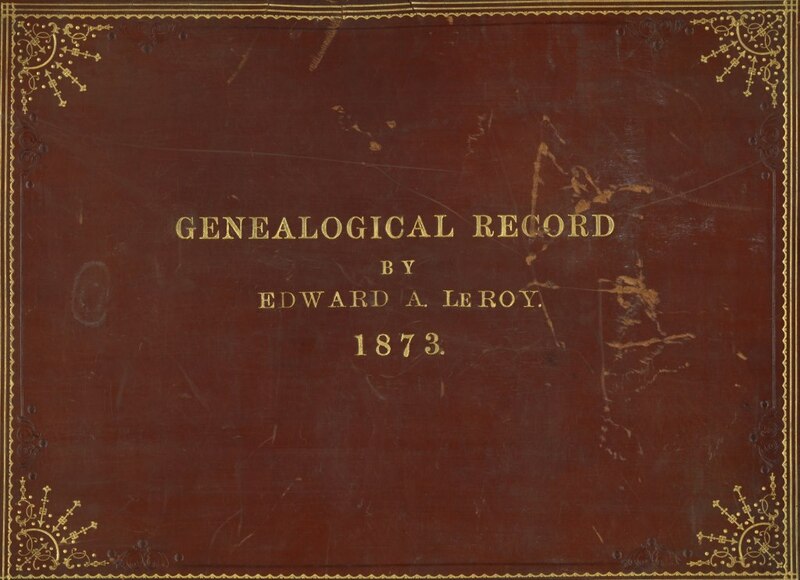 Recently, I was directed to – and subsequently acquired – a Le Roy family register compiled by my cousin Edward Augustus Le Roy (1833–1913), one that showed all the descendants of the Le Roy immigrant down to about 1890. More than a decade ago, I wrote a genealogy of the Le Roy family of New York with my cousin Newbold Le Roy 3rd, Edward’s great-grandson. Because Edward married his cousin Clementina Barnewall Pell – like him a descendant of Jacob Le Roy and Cornelia Rutgers – Edward’s descendants have two Le Roy lines, and no doubt his interest in the Le Roy and allied families was enhanced by this double kinship. 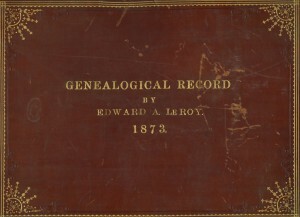 He produced several Le Roy registers – Newb’s son Robert has a later one – each one painstakingly filled in in a lovely Victorian copperplate hand, with red lines crisscrossing the page to indicate the children of a Le Roy family member. The register also has pages devoted to other ancestral families of Edward and Clementina Le Roy: Cornell, Rutgers, Pell, Otis, and Downes. For Newb, a descendant of all those families, such a register is a godsend. As for me, both copies of the Le Roy register provide the only date of birth I have for my great-great-grandmother, Catharine Elizabeth White (1818–1867), who married John Steward Jr. in 1841. The Steward Bible has Catharine’s date and place of death, but – perhaps owing to shyness about committing her age to print – I do not think that any of her Steward descendants knew where and when she was born before our Le Roy genealogy was published in 2003. When Newb and I set out to write the Le Roy genealogy, we used his copy of the register to sketch out a list of Jacob’s descendants by his two wives, sisters Cornelia and Catherine Rutgers. It enabled us to trace the large numbers of Herman Le Roy and Maria Anna (Le Roy) Livingston descendants, while devoting equivalent attention to the families descended from Jacob Le Roy (Jr.), Elizabeth (Le Roy) McEvers, and Robert Le Roy, each a fraction in size of the Herman and Maria Anna branches. Several Le Roys married into the Livingston family, while several others married Edgars and Emmets and other Le Roys. One of Herman’s daughters, Caroline, married Daniel Webster, while a great-granddaughter was a namesake of Edith Wharton’s. A great-grandson of Jacob2 Le Roy, Henry White, served as U.S. Ambassador to Italy and then France, signing the Treaty of Versailles after President Woodrow Wilson and Secretary of State Robert Lansing. More recent descendants include Mrs. Martin Scorsese (Helen Schermerhorn Morris), the former Mrs. Ilie Nastase (Adelaide Alexandra King), and William Bradford (Brad) Hall, the actor and writer – in all, more than 2,800 when we published the book in 2003. Scott – when you mentioned Maria Anna (Le Roy) Livingston are talking about someone who married a John Livingston (1750-1882) and resided at Oak Hill, about 120 miles north of NYC on the Hudson River? If so, I have visted there many times, cousin Hank Livingston resides there now. I am descended from Philip (The Signer) Livingston and my paternal grandmother was a Livingston. Do you have, or would you like, the appropriate pages from the Livingston Genealogy? And another Le Roi married a Fish, descended from Margaret Livingston and Peter Stuyvesant. Howland, Yes, Maria Anna Le Roy and her descendants are covered in the book Newb Le Roy and I published in 2003: THE LE ROY FAMILY IN AMERICA, 1753-2003.